This is one of the most interesting lists we have ever made; celebrities with Heterochromia. 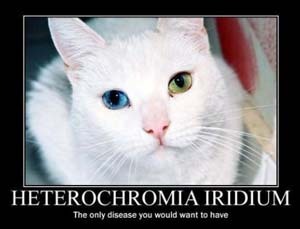 What is Heterochromia, you ask. This is not a medical site, but in simpler words it is a condition where someone’s eyes have different colors due to an unequal melanin distribution on iris. It can also happen to hair and skin, so to make things clear there are terms heterochromia iridum and heterochromia iridis to refer to the heterochromia of the eye. Now let’s take a look at our list of celebrities with different colored eyes. Kate Bosworth’s eyes deserve to be top of the list. While heterochromia is categorized as an abnormality but in fact it gives priceless look of eyes to her. Blue left eye and hazel-blue in the right hypnotize anyone who looks at them. And we must admit that her eyes play role in popularizing the word ‘heterochromia’. Alice Eve has almost complete heterochromia. Green right eye looks perfect with her blue left eye. Just like Kate Bosworth, her mismatched colored eyes are irresistible. It is hard to believe that Alice’s boyfriend needed nine months to notice those beautiful colors. 66-year-old British-American actress has many things to capture our hearts. Those different colored eyes are real examples. Despite eyelift rumor, that partially brown right eye and the green left eye are hard to resist. Seymour’s bewitching eyes are cure to our bad day. Natural different colored eyes of Elizabeth Berkley is famous enough. Combination of brown and green makes strikingly unique right eye. It is perfect pair for that all green left eye. 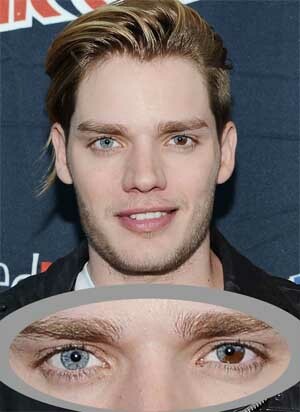 27-year-old English actor, Dominic Sherwood has partial Heterochromia iridis that gives dark brown color to his blue left eye. His right blue eye is beautiful, too. 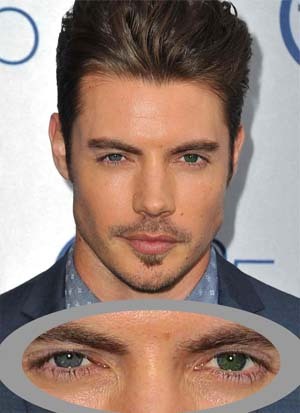 If there is a competition for best male celebrities with different colored eyes, most votes would easily choose Josh Henderson. Blue in the right eye and green in the left eye, what’s better that? Heterochromia doesn’t happen only to stars who work in the show business. 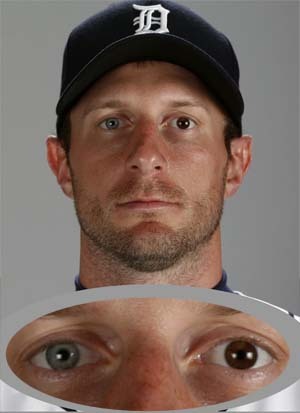 And it is impossible not to say Washington Nationals’s pitcher, Max Scherzer’s eyes. His complete heterochromia is very popular. And we can understand why. That blue eyes strikingly contrasts with the brown eye. These celebrities show perfect yin and yang on their eyes. Share you comment about those bewitching eyes below.